← A visit to Zenith, and a thousand miles to home. Back in Florida after 7,380 miles on tour. I made it back home on July 3rd. We have about 15 days in the shop it make parts and prepare before departing for Brodhead and Oshkosh. It was a great trip, I directly worked with more than 120 builders, who made a lot of progress and learned a lot, all while having fun with other traditional home builders. The pink line on the map is the route track, the arrows a places I spent the night in route. Only one night was in a motel, the rest was staying with friends or camping. The high tech graphics package here is a map from Cracker Barrel and a crayon. It appealed to my grease monkey level of sophistication. The suburban pulling the trailer of tools got 10.5 mpg average on the trip, not great, but not bad for a truck that cost $1,700 when I bought it from Northrop Grumman 34 months and 54,000 miles ago. 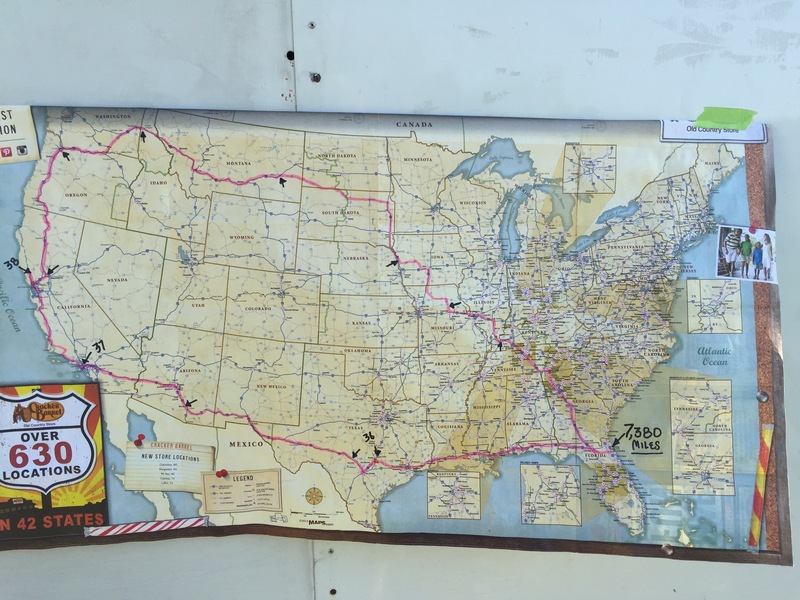 During the trip I flew commercial two round trips across the continent, and drove a 1,000 mile leg from NJ to FL. All totaled, it was about 19,000 miles of travel March 28 to July 3. For all the builders we worked with, the engines run, and the house calls made, not one person paid a single dime. The trip is a demonstration of my commitment to traditional home builders, now in my 27th year in our industry. When Internet personalities claim I am solely motivated by money, and that I don’t place builders interests first, let our 2016 Western College Tour stand as evidence to the contrary. If you want to make progress and achieve your own goals in home building and flying, it is a smart bet to follow proven people rather than the council of critics. 4 Responses to Back in Florida after 7,380 miles on tour. Trip.. no, journey…not quite, epic voyage….odyessy…now we’re talkin! I just wanted to thank you for coming out West and providing us with the benefit of attending College #37 in Chino,CA. Not only was it fun and informative but I got to know two gracious and outstanding hosts (you and Steve).. So thank you for making all that possible. On a less favorable note, the Editor (Mike McGowan) of the CORSA Communique has put my article and photos of CC#37 on the “back burner” for publication. It will now be published some tine in the Fall he says. I had hoped to get in print by now. Thanks for all the ecouragement, information, and teaching that you and Dan Wesemann did. I ended up talking to a diesel mechanic the other evening, and I was glad to turn him on to the conversions of Corvairs for flight. I’ve referred him to your website. He’s a gearhead and a die hard Chevy guy, not interested in flying, but he loves learning about all sorts of engines. Is your Suburban a diesel?